Achenar rotates much faster than our Sun. It is located at the lower right of the constellation Eridanus. Since it was first discovered in 1974, astronomers have been dying to get a better look at the Supermassive Black Hole (SBH) at the center of our galaxy. Known as Sagittarius A*, scientists have only been able to gauge the position and mass of this SBH by measuring the effect it has on the stars that orbit it. But so far, more detailed observations have eluded them, thanks in part to all the gas and dust that obscures it. Luckily, the European Southern Observatory (ESO) recently began work with the GRAVITY interferometer, the latest component in their Very Large Telescope (VLT). Using this instrument, which combines near-infrared imaging, adaptive-optics, and vastly improved resolution and accuracy, they have managed to capture images of the stars orbiting Sagittarius A*. And what they have observed was quite fascinating. One of the primary purposes of GRAVITY is to study the gravitational field around Sagittarius A* in order to make precise measurements of the stars that orbit it. In so doing, the GRAVITY team – which consists of astronomers from the ESO, the Max Planck Institute, and multiple European research institutes – will be able to test Einstein’s theory of General Relativity like never before. In what was the first observation conducted using the new instrument, the GRAVITY team used its powerful interferometric imaging capabilities to study S2, a faint star which orbits Sagittarius A* with a period of only 16 years. This test demonstrated the effectiveness of the GRAVITY instrument – which is 15 times more sensitive than the individual 8.2-metre Unit Telescopes the VLT currently relies on. But more than that, the observation of S2 was very well timed. In 2018, the star will be at the closest point in its orbit to the Sagittarius A* – just 17 light-hours from it. As you can see from the video below, it is at this point that S2 will be moving much faster than at any other point in its orbit (the orbit of S2 is highlighted in red and the position of the central black hole is marked with a red cross). When it makes its closest approach, S2 will accelerate to speeds of almost 30 million km per hour, which is 2.5% the speed of light. Another opportunity to view this star reach such high speeds will not come again for another 16 years – in 2034. And having shown just how sensitive the instrument is already, the GRAVITY team expects to be able make very precise measurements of the star’s position. In fact, they anticipate that the level of accuracy will be comparable to that of measuring the positions of objects on the surface of the Moon, right down to the centimeter-scale. As such, they will be able to determine whether the motion of the star as it orbits the black hole are consistent with Einstein’s theories of general relativity. “[I]t is not the speed itself to cause the general relativistic effects,” explained Eisenhauer, “but the strong gravitation around the black hole. But the very high orbital speed is a direct consequence and measure of the gravitation, so we refer to it in the press release because the comparison with the speed of light and the ISS illustrates so nicely the extreme conditions. As recent simulations of the expansion of galaxies in the Universe have shown, Einstein’s theories are still holding up after many decades. However, these tests will offer hard evidence, obtained through direct observation. A star traveling at a portion of the speed of light around a supermassive black hole at the center of our galaxy will certainly prove to be a fitting test. While those of us here at Earth will not be able to “star gaze” on this occasion and see R2 whipping past Sagittarius A*, we will still be privy to all the results. And then, we just might see if Einstein really was correct when he proposed what is still the predominant theory of gravitation in physics, over a century later. How Massive Can Black Holes Get? We talk about stellar mass and supermassive black holes. What are the limits? How massive can these things get? Without the light pressure from nuclear fusion to hold back the mass of the star, the outer layers compress inward in an instant. The star dies, exploding violently as a supernova. All that’s left behind is a black hole. They start around three times the mass of the Sun, and go up from there. The more a black hole feeds, the bigger it gets. Terrifyingly, there’s no limit to much material a black hole can consume, if it’s given enough time. The most massive are ones found at the hearts of galaxies. These are the supermassive black holes, such as the 4.1 million mass nugget at the center of the Milky Way. Astronomers figured its mass by watching the movements of stars zipping around the center of the Milky Way, like comets going around the Sun. There seems to be supermassive black holes at the heart of every galaxy we can find, and our Milky Way’s black hole is actually puny in comparison. 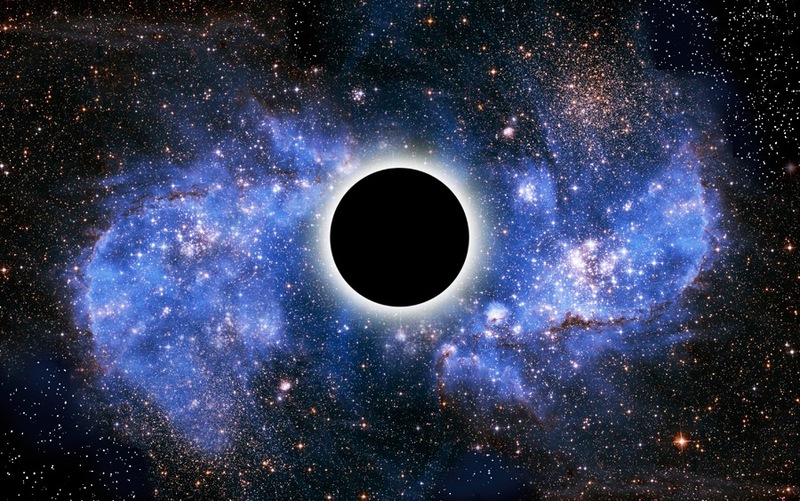 Interstellar depicted a black hole with 100 million times the mass of the Sun. And we’re just getting started. The giant elliptical galaxy M87 has a black hole with 6.2 billion times the mass of the Sun. How can astronomers possibly know that? They’ve spotted a jet of material 4,300 light-years long, blasting out of the center of M87 at relativistic speeds, and only black holes that massive generate jets like that. Most recently, astronomers announced in the Journal Nature that they have found a black hole with about 12 billion times the mass of the Sun. The accretion disk here generates 429 trillion times more light than the Sun, and it shines clear across the Universe. We see the light from this region from when the Universe was only 6% into its current age. Somehow this black hole went from zero to 12 billion times the mass of the Sun in about 875 million years. Which poses a tiny concern. Such as how in the dickens is it possible that a black hole could build up so much mass so quickly? Also, we’re seeing it 13 billion years ago. How big is it now? Currently, astronomers have no idea. I’m sure it’s fine. It’s fine right? We’ve talked about how massive black holes can get, but what about the opposite question? How teeny tiny can a black hole be? Astronomers figure there could be primordial black holes, black holes with the mass of a planet, or maybe an asteroid, or maybe a car… or maybe even less. There’s no method that could form them today, but it’s possible that uneven levels of density in the early Universe might have compressed matter into black holes. Those black holes might still be out there, zipping around the Universe, occasionally running into stars, planets, and spacecraft and interstellar picnics. I’m sure it’s the stellar equivalent of smashing your shin on the edge of the coffee table. Astronomers have never seen any evidence that they actually exist, so we’ll shrug this off and choose to pretend we shouldn’t be worrying too much. And so it turns out, black holes can get really, really, really massive. 12 billion times the mass of the Sun massive. What part about black holes still make you confused? Suggest some topics for future episodes of the Guide to Space in the comments below. Back in 1988, astronomer Jack Hills predicted a type of “rogue”star might exist that is not bound to any particular galaxy. These stars, he reasoned, were periodically ejected from their host galaxy by some sort of mechanism to begin traveling through interstellar space. Since that time, astronomers have made numerous discoveries that indicate these rogue, traveling stars indeed do exist, and far from being an occasional phenomenon, they are actually quite common. What’s more, some of these stars were found to be traveling at extremely high speeds, leading to the designation of hypervelocity stars (HVS). And now, in a series of papers that published in arXiv Astrophysics, two Harvard researchers have argued that some of these stars may be traveling close to the speed of light. Known as semi-relativistic hypervelocity stars (SHS), these fast-movers are apparently caused by galactic mergers, where the gravitational effect is so strong that it fling stars out of a galaxy entirely. These stars, the researchers say, may have the potential to spread life throughout the Universe. This finding comes on the heels of two other major announcements. The first occurred in early November when a paper published in the Astrophysical Journal reported that as many as 200 billion rogue stars have been detected in a cluster of galaxies some 4 billion light years away. These observations were made by the Hubble Space Telescope’s Frontier Fields program, which made ultra-deep multiwavelength observations of the Abell 2744 galaxy cluster. This was followed by a study published in Science, where an international team of astronomers claimed that as many as half the stars in the entire universe live outside of galaxies. However, the recent observations made by Abraham Loeb and James Guillochon of Harvard University are arguably the most significant yet concerning these rogue celestial bodies. According to their research papers, these stars may also play a role in spreading life beyond the boundaries of their host galaxies. In their first paper, the researchers trace these stars to galaxy mergers, which presumably lead to the formation of massive black hole binaries in their centers. According to their calculations, these supermassive black holes (SMBH) will occasionally slingshot stars to semi-relativistic speeds. These findings have further reinforced that massive compact bodies, widely known as a supermassive black holes (SMBH), exist at the center of galaxies. Here, the fastest known stars exist, orbiting the SMBH and accelerating up to speeds of 10,000 km per second (3 percent the speed of light). According to Leob and Guillochon, however, those that are ejected as a result of galactic mergers are accelerated to anywhere from one-tenth to one-third the speed of light (roughly 30,000 – 100,000 km per second). Observing these semi-relativistic stars could tell us much about the distant cosmos, according to the Harvard researchers. Compared to conventional research, which relied on subatomic particles like photons, neutrinos, and cosmic rays from distant galaxies, studying ejected stars offers numerous advantages. In their second paper, the researchers calculate that there are roughly a trillion of these stars out there to be studied. And given that these stars were detected thanks to the Spitzer Space Telescope, it is likely that future generations will be able to study them using more advanced equipment. All-sky infrared surveys could locate thousands of these stars speeding through the cosmos. And spectrographic analysis could tell us much about the galaxies they came from. But how could these fast moving stars be capable of spreading life throughout the cosmos? The possibility that traveling stars and planets could have been responsible for the spread of life throughout the universe is likely to have implications as a potential addition to the Theory of Panspermia, which states that life exists throughout the universe and is spread by meteorites, comets, asteroids. But Loeb told Universe Today that a traveling planetary system could have potential uses for our species someday. “Our descendants might contemplate boarding a related planetary system once the Milky Way will merge with its sister galaxy, Andromeda, in a few billion years,” he said. Scientists have long suspected that supermassive black holes (SMBH) reside at the center of every large galaxy in our universe. These can be billions of times more massive than our sun, and are so powerful that activity at their boundaries can ripple throughout their host galaxies. In the case of the Milky Way galaxy, this SMBH is believed to correspond with the location of a complex radio source known as Sagittarius A*. Like all black holes, no one has even been able to confirm that they exist, simply because no one has ever been able to observe one. But thanks to researchers working out of MIT’s Haystack Observatory, that may be about to change. Using a new telescope array known as the “Event Horizon Telescope” (EHT), the MIT team hopes to produce this “image of the century” very soon.Initially predicted by Einstein, scientists have been forced to study black holes by observing their apparent effect on space and matter in their vicinity. These include stellar bodies that have periodically disappeared into dark regions, never to be heard from again. To create the EHT array, the scientists linked together radio dishes in Hawaii, Arizona, and California. The combined power of the EHT means that it can see details 2,000 times finer than what’s visible to the Hubble Space Telescope. These radio dishes were then trained on M87, a galaxy some 50 million light years from the Milky Way in the Virgo Cluster, and Sagittarius A* to study the event horizons at their cores. Other instruments have been able to observe and measure the effects of a black hole on stars, planets, and light. But so far, no one has ever actually seen the Milky Way’s Supermassive black hole. Doeleman’s research focuses on studying super massive black holes with sufficient resolution to directly observe the event horizon. To do this his group assembles global networks of telescopes that observe at mm wavelengths to create an Earth-size virtual telescope using the technique of Very Long Baseline Interferometry (VLBI). Ultimately, the EHT project is a world-wide collaboration that combines the resolving power of numerous antennas from a global network of radio telescopes to capture the first image ever of the most exotic object in our Universe – the event horizon of a black hole. First postulated by Albert Einstein’s Theory of General Relativity, the existence of black holes has since been supported by decades’ worth of observations, measurements, and experiments. But never has it been possible to directly observe and image one of these maelstroms, whose sheer gravitational power twists and mangle the very fabric of space and time. Finally being able to observe one will not only be a major scientific breakthrough, but could very well provide the most impressive imagery ever captured. Determining the distance of galaxies from our Solar System is a tricky business. Knowing just how far other galaxies are in relation to our own is not only key to understanding the size of the universe, but its age as well. In the past, this process relied on finding stars in other galaxies whose absolute light output was measurable. By gauging the brightness of these stars, scientists have been able to survey certain galaxies that lie 300 million light years from us. However, a new and more accurate method has been developed, thanks to a team of scientists led by Dr. Sebastian Hoenig from the University of Southampton. Similar to what land surveyors use here on Earth, they measured the physical and angular (or apparent) size of a standard ruler in the galaxy to calibrate distance measurements. In a finding that could turn supermassive black hole formation theories upside-down, astronomers have spotted one of these beasts inside a tiny galaxy just 157 light-years across — about 500 times smaller than the Milky Way. The clincher will be if the team can find more black holes like it, and that’s something they’re already starting to work on after the discovery inside of galaxy M60-UCD1. The ultracompact galaxy is one of only about 50 known to astronomers in the nearest galaxy clusters. “It’s very much like a pinprick in the sky,” said lead researcher Anil Seth, an astrophysicist at the University of Utah, of M60-UCD1 during an online press briefing Tuesday (Sept. 16). Seth said he realized something special was happening when he saw the plot for stellar motions inside of M60-UCD1, based on data from the Gemini North Telescope in Hawaii. The stars in the center of the galaxy were orbiting much more rapidly than those at the edge. The velocity was unexpected given the kind of stars that are in the galaxy. In its weight class, M60-UCD1 is a standout. Last year, Seth was second co-author on a group that announced that it was the densest nearby galaxy, with stars jam-packed 25 times closer than in the Milky Way. It’s also one of the brightest they know of, a fact that is helped by the galaxy’s relative closeness to Earth. 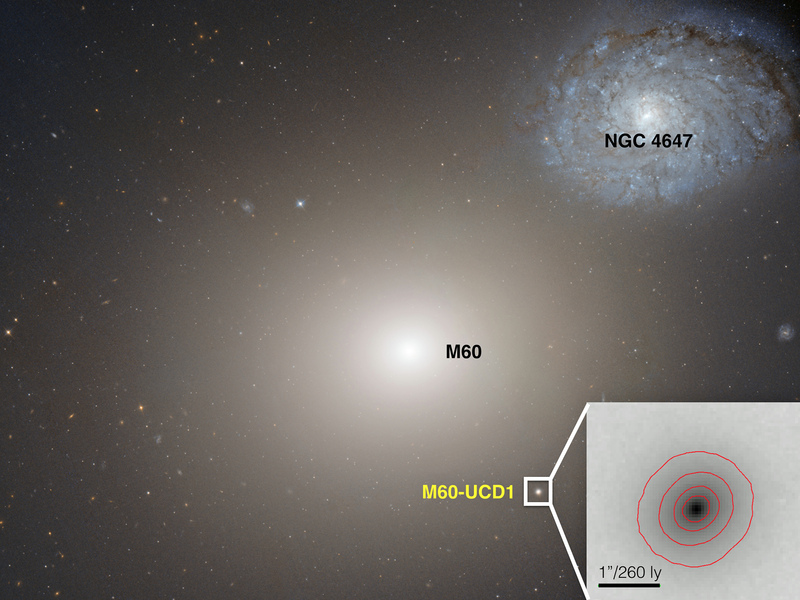 It’s roughly 54 million light-years away, as is the massive galaxy it orbits: M60. The two galaxies are only 20,000 light-years apart. Supermassive black holes are known to lurk in the centers of most larger galaxies, including the Milky Way. How they got there in the first place, however, is unclear. 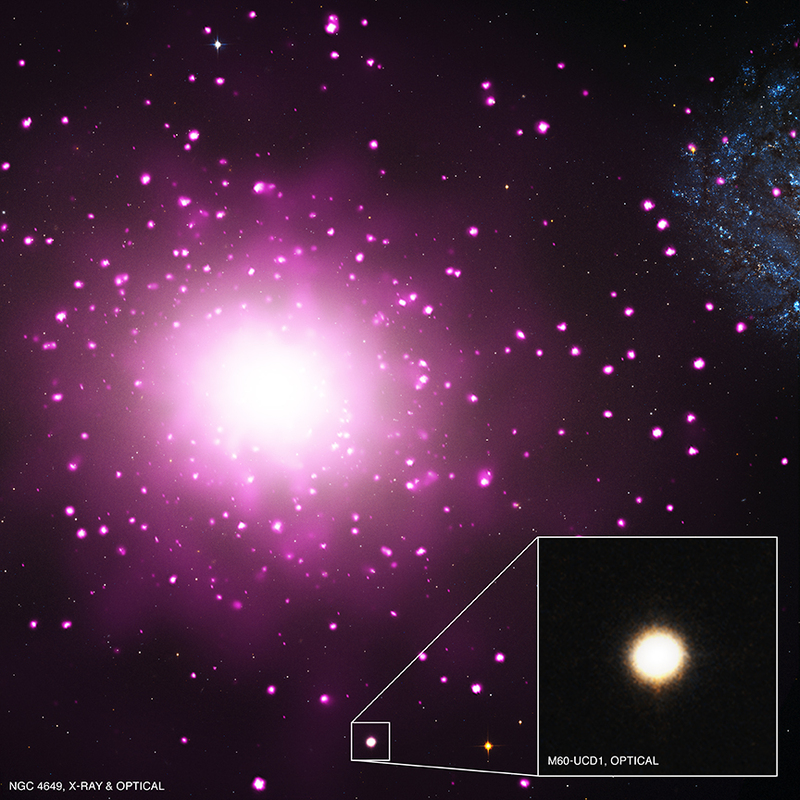 The find inside of M60-UCD1 is especially intriguing given the relative size of the black hole to the galaxy itself. The black hole is about 15% of the galaxy’s mass, with an equivalent mass of 21 million Suns. The Milky Way’s black hole, by contrast, takes up less than a percentage of our galaxy’s mass. Given so few ultracompact galaxies are known to astronomers, some basic properties are a mystery. For example, the mass of these galaxy types tends to be higher than expected based on their starlight. Some astronomers suggest it’s because they have more massive stars than other galaxy types, but Seth said measurements of stars within M60-UCD1 (based on their orbital motion) show normal masses. The extra mass instead comes from the black hole, he argues, and that will likely be true of other ultracompact galaxies as well. His team plans to look at several other ultracompact galaxies such as M60-UCD1, but perhaps only seven to eight others would be bright enough from Earth to perform these measurements, he said. (Further work would likely require an instrument such as the forthcoming Thirty-Meter Telescope, he said.) Additionally, Seth has research interests in globular clusters — vast collections of stars — and plans a visit to Hawaii next month to search for black holes in these objects as well. Results were published today (Sept. 17) in the journal Nature. What Would It Be Like To Fall Into A Black Hole? We know it won’t take you to another world or galaxy, but what would you experience and see on your way to your inevitable demise? And what would the rest of the Universe see as this was happening, and would they point and say “eewwwwww”? If you were falling toward a black hole, most of the time you would simply feel weightless, just as if you were playing Bowie songs and floating in a most peculiar way in the International Space Station. The gravity of a black hole is just like the gravity of any other large mass, as long as you don’t get too close. But, as we’ve agreed, you’re ignoring my advice and flying dragon first into this physics nightmare. As you get closer, the gravitational forces on various parts of your and your dragon’s body would be different. Technically this is always true, but you wouldn’t notice it… at least at first. Suppose you were falling feet first toward a black hole. As you got closer, your feet would feel a stronger force than your head, for example. These differences in forces are called tidal forces. Because of the tidal forces it would feel as if you are being stretched head to toe, while your sides would feel like they are being pushed inward. Eventually the tidal forces would become so strong that they would rip you apart. This effect of tidal stretching is sometimes boringly referred to as spaghettification. I’ve made up some other names for it, such as My Own Private String Cheese Incident, “the soft-serve effect” and “AAAHHHHH AHHHH MY LEGS MY LEGS!!!”. So, let’s summarize. You wouldn’t survive falling toward a black hole because you wouldn’t listen. Why won’t you ever listen? A friend watching you fall toward a black hole would never see you reach the black hole. As you fall towards it, gravity would cause any light coming from you to be redshifted. So as you approached the black hole you would appear more and more reddish, and your image would appear dimmer and dimmer. Your friend would see you redden and dim as you approach, but never quite reach, the event horizon of the black hole. If they could still see you past this point, there would be additional red from the inside of you clouding up the view. would you see then? Contrary to popular belief, you would not see the entire future of the universe flash before you. What you would see is the darkness of the black hole fill your view and as you approached the event horizon you would see stars and galaxies on the edge of your view being gravitationally lensed by the black hole. The sky would simply appear more and more black until you reach the event horizon. Many people think that it is at the event horizon where you would be ripped apart, and at the event horizon all sorts of strange things occur. Unfortunately, this goes along with those who suspect black holes are actually some sort of portal. For a solar mass black hole, the tidal forces near the event horizon can be quite large, but for a supermassive black hole they aren’t very large at all. In fact, the larger the black hole, the weaker the tidal forces near its event horizon. So if you happened to be near a supermassive black hole, you could cross the event horizon without really noticing. Would you still be totally screwed? YOU BETCHA! What do you think? If you could drop anything into a black hole, what would it be? Tell us in the comments below. Wondering about the latest news on the intriguing object called ‘G2’ that is making its closest approach to the supermassive black hole at the center of our galaxy? You might be able to get the latest update on this object in real time during a rare live-streamed observing run from the W. M. Keck Observatory in Hawaii. Watch live above. The two 10-meter Keck Observatory telescopes on the summit of Mauna Kea will be steered by astronomer Andrea Ghez and her team of observers from the UCLA Galactic Center Group for two nights to study our galaxy’s supermassive black hole, with an attempt to focus in on the enigmatic G2 to see if it is still intact. They’ll also be setting up a test for Einstein’s General Relativity and gathering more data on what they describe as The Paradox of Youth: young objects paradoxically developing around the black hole. The most previous observations by the Keck Observatory in Hawaii, according to an Astronomer’s Telegram from May 2, 2014 show that the gas cloud called ‘G2’ was surprisingly still intact, even during its closest approach to the supermassive black hole. This means G2 is not just a gas cloud, but likely has a star inside.